Say goodbye to uncomfortable plastic masks or sweaty (and ill-smelling) latex hoods. 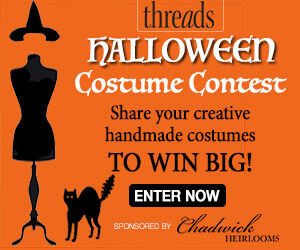 Put a little craft into your costume this year and have a ghoulishly good time doing it. While made as a mask, this bony creation can easily double as a pumpkin-clutching centerpiece on your holiday table. A few simple paper shapes are all you need to build this crypt claw. In the spirit of full disclose (and at the risk of being thought a party pooper), I have a problem with Halloween masks. It's not that I don't like dressing up; I do. And, when I dress up, ghoulish attire is my preferred style. It's just that I find most masks uncomfortable, hot, and unaccommodating when it comes to people (like me) who wear glasses. With All Hallows Eve approaching, the requests have started coming in from friends-"Can you make me a mask for a party I'm going to"-and it's gotten me wondering if there isn't some better way to approach this matter. As I've said, I like the dress-up part, the ghoulish part, and the theatrical elements of the holiday; I just don't want to be hot, sweaty, and trapped inside a latex lizard head. To my way of thinking, the Venetians had the right idea when they perfected the masked ball a few hundred years ago: Put your mask on a stick and carry it with you. The frightful effect is the same with the added benefit that one can easily remove the mask to smile at the host of the party, kiss a neighbor on the cheek, partake of some delicious hors d'oeuvres or, in a perfect world, munch on handfuls of candy corn. And so, today, I offer up "The Claw." It's not exactly a frilly court mask on a ribboned stick, but you can see where I got the idea. Download a 1/2 scale template, and trace the figures onto a sheet of white cardstock or watercolor paper. After cutting out the pieces, score them as indicated by the dotted lines on the template. I started with the Radius and Ulna bones of the arm. Once scored, crease the paper firmly to give it dimension. Working from the notch cut into the end of each arm bone, overlap the two edges slightly (1/4 inch or so), glue, and hold in place until dry. SamanthaJones writes: Great Halloween crafting, it costs a lot of time and efforts, but the results are amazing. It can also be combined with various costumes. genalorainne writes: A little bit too much efforts for me, personally, but it looks totally awesome. christianreese writes: Looks really good, but how does it stay on your face? I think it would make a better decoration for the kitchen table than a mask. EchoLin writes: Fabulous idea, so cute. tscreates writes: Great way to craft for Halloween. Wish I had more time - I would certainly try this one. Toffy writes: I think this is an amazing idea and scary. Great execution. I would try this and make a few for my entryway table. Thanks for this great idea. daperfectmix writes: maybe it's dejavu, but i swear i saw this post before. it's still awesome! you will have more sale for your creativity. You should take some photos of your work and add them to the gallery so we can all see how they came out. gravityworks2 writes: I made a few of these for decorations for a kids party. Very easy to make. Deana writes: I agree with Jen W. So scary! But, so good! sophiesattic writes: I showed my 16yo old son, and he thought this was cool. I am going to try it right now! Jen_W writes: Jeff, you are scary. Scary-good, that is. gravityworks2 writes: That is just too cool! JenniferStern writes: Jeffery--You are amazing!